League One side Oldham Athletic have taken strikers Ricardo Fuller and Febian Brandy on trial. 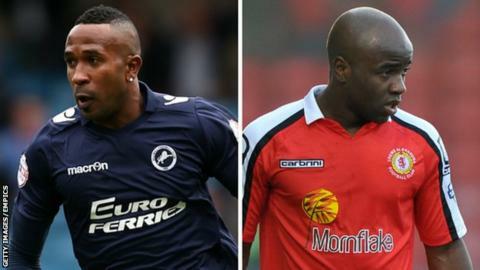 Former Jamaica international Fuller, 35, spent last season with Millwall and has played for 10 British clubs including Stoke, Preston and Charlton. Brandy, 26, finished last term at Rochdale where the ex-Manchester United trainee made four appearances. "It is fair to say that Ricardo has been training with us," interim manager David Dunn told BBC Radio Manchester. "He's looking sharp so we'll see how that pans out in the next few weeks." Dunn, 35, has been in charge for three matches since taking charge following the sacking of Darren Kelly, with all three finishing in 1-1 draws. "I'm always a man that is a glass half full," he added. "There is quite a lot of negative stuff that happens in football, not just at our place, so I think it helps when everyone is positive and that's what we're going to try and do."